San Antonio point guard Patty Mills’ contract expires at the end of the 2016-17 NBA season, and he becomes a free agent. The 28 year-old Australian has garnered a larger role in the Spurs’ lineup this season, suggesting that he could handle being a starter. This makes his next contract much more intriguing. Let’s take a look at what Patty Mills next contract could look like. Patty Mills is an unrestricted free agent, meaning he can sign with any team regardless if San Antonio match an offer. However, San Antonio hold his ‘Bird’ rights, as he has played for at least 3 seasons with the team. This means that San Antonio can offer him a 5 year contract with raises of 7.5% per year of his first year salary. Other teams can only offer him a 4 year deal with raises of 4.5%. Patty Mills can get a maximum of 30% of the salary cap as he has completed between 7-9 years of service in the league. The projected salary cap is $102 million, and only San Antonio can go over this amount to sign him. The projected luxury tax cap is $122 million, meaning teams who are paying over this amount incur a tax to be paid to the league. At worst, Patty Mills is the 6th man on the Spurs’ roster, and potentially the starting point guard on another team. 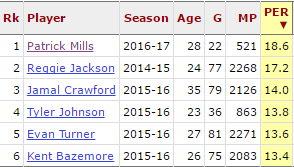 I’ve identified 5 players who play at the guard position that are similar to Patty Mills, and who recently signed a new contract. Some are starters, and some are their team’s 6th man. Here are their contracts. I’ve used 3 indices to compare the players. Firstly, their stats per 36 minutes. As you can see, Patty Mills’s stats are quite comparable to the other players. He leads the way in shooting percentage, while falling somewhere in the middle on rebounds, assists and points. Some of the players in this comparison play wing, meaning they garner a higher amount of rebounds. This is where Mills really excels. Once again, his shooting percentage is higher than others, and he ranks 2nd on assists. Where he really stand out is his efficiency ratings. He is roughly 10% more efficient offensively than the 2nd placed Tyler Johnson, and equal 1st on defense. The final comparison is their Player Efficiency Rating (PER) rating. This stat deduces all their contributions into one number, whether they be positive or negative. Patty’s PER this season is clearly ahead of the others at their time of signing their big contracts. With this in mind, let’s look at the dollars. The maximum contract Mills can get is with a starting salary of $30.6 million. That can be ruled out. As mentioned previously San Antonio can offer him the largest annual raises, and the longest length contract. However, I don’t believe they will offer him a 5 year deal, unless the last year is a team option. 4 years is much more likely. 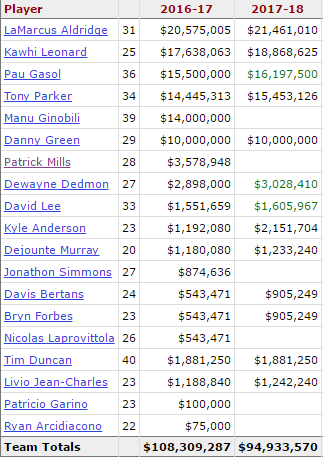 Patty Mills’ market value works out to be roughly $18.6 million per season. This doesn’t necessarily mean San Antonio will offer him a contract, and may let him go in free agency. Tony Parker is ageing, and they may opt to move for a big name point guard. Based on this contract he would be taking up approximately 16-17% of the cap, which is not outrageous for a 6th man. Manu Ginobili will retire, so he will not re-sign. Pau Gasol, Dewayne Dedmon and David Lee all have player options. They would all be expected to exercise them. Jonathon Simmons has had a breakout year, and he may be lost to another team. San Antonio may look to trade Pau Gasol, freeing up his obligation next season. That would only leave roughly $77 million in commitments and allow the team to target a big name free agent. They would also be able to re-sign Mills. If he was not to re-sign with the Spurs, who will he sign with? There are plenty of teams with cap space who could see Patty Mills as a starting point guard. Dallas, Denver and Philadelphia all have a need at the PG and cap space to facilitate Mills’ market value. Wherever Patty plays next season, he should overtake Andrew Bogut as having the largest NBA contract ever awarded to an Australian athlete.